All want a dream home built for themselves which looks “different’ from the others. I want a office building which looks ‘different’ and this difference is designed by architects who fore see a vision of ones mind and get them on paper and then into reality. Belgaumite Praveen Bavadekar is a person who returned to his small town roots rather than being in the metros. Praveen is a M.Arch from the Architectural Association-London, and heads thirdspace studio Belgaum. 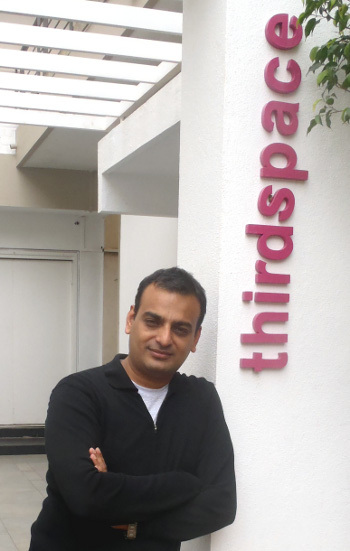 He is also the co-founder of thirdspace Bangalore. In the Belgaum studio, he heads a team of around 15 persons, and juggles between his studio, academics and teaching, and even farming in his ancestral farms. He completed B.Arch in 1995, from BMS college of engineering, Bangalore and his schooling from St.Paul’s High School Belgaum. 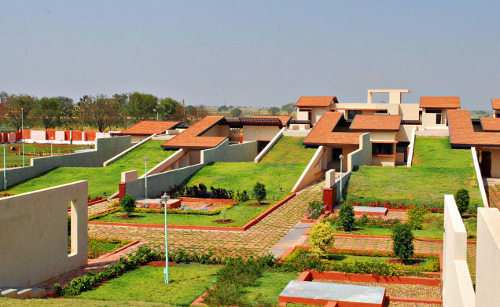 He worked as an architect in Bangalore, Mumbai and Belgaum from 1996 to 1999, before he went to study further in the UK. Since he began practising in Belgaum in 2002, Bavadekar has built a number of projects that, as Himanshu Burte said in a recent article in Livemint, are injecting an international sensibility into this small town setting. With opportunities increasing, he is trying to bring in talented architects from other cities to keep the bar high. Belgaum also has a deep significance for his family, with his great grandfather, Karnatak Simha Gangadharrao Deshpande being a famous freedom fighter from this region. Based in Bangalore and Belgaum, thirdspace is envisaged as a network of professionals working on architectural/ urban projects. The practice is a loosely defined organisation, which is always open to ‘cross pollination’ from various synergetic sources. Their projects themselves blur traditionally accepted boundaries, looking at urban issues in interior projects and architectural issues within urban proposals. The diversity of the work, also lets them experiment with similar generative techniques across different scales of budgets, size and typologies. Praveen with his team at thirdspace, have worked on several prestigious projects, including the Gururaj Deshpande funded Deshpande Center for Social entrepreneurship at Hubli and has also won the competition project for the Gangubai hangal Gurukula at Hubli. The practise has published a lot of its projects, and Praveen has given lectures on his projects at several architectural schools and conventions. Praveen’s farmhouse at Hudali is also included in the book 91 residences, by incite publications. About Belgaum he says, “ Belgaum has some of the traits that I mentioned about my idea of a good city, but in a very latent way. Though, I like to stay in Belgaum, and I like to see my son inhabit and negotiate the very same spaces of my childhood. But the city is being reduced to just another dusty overgrown town. What we don’t realise is that cities need to be nurtured, and Belgaum, like many Indian cities is being milked to death. The Cantonment may be the only saving grace of Belgaum, at least for some time. What made you want to be an architect and Was there an event, a moment early on that influenced you? Praveen —-> A cocktail of influences at an early age made me choose architecture. My brother-in-law is an architect in Bangalore, and I was quite influenced by him. I always read a lot, and Ayn Rands fountainhead did mess my head a bit, when I was 14 years old. Any books or teachers/role models that helped you or influenced you? Praveen —-> I am continually influenced by varied sources. The formative years in St Pauls were a big influence, and the habit of reading that was inculcated in school helped me tremendously in my development as an architect. My London days were a big influence, and the AA is known for its packed schedule of lectures and events. I attended lectures of many great architects, philosophers, artists and thinkers, like Koolhaas, Tschumi etc. My course director, Patrick Schumacher, is a great architect and a passionate teacher. Praveen —-> Architecture, the way we try to do it, is not so much about inspiration as it is about deploying strategies. Programs and sites are analysed using various parameters to arrive at design strategies. One could say that design is coaxed out of the context. Its hard to pin point, at what time, a design develops. Some big projects have been resolved in a day, whereas in some other small projects we have failed to resolve a solution even after months. Praveen —-> Our buildings are not merely visual, they explore certain relationships of form/ space/ function. In the deshpande center, we explore how two forms come together to generate an interstice, an in-between space, that complements the building with its absence. The gangubai hangal gurukul was about weaving two strands of pedagogical philosophies, the eastern and the western, into a spatial fabric. Here, traditional elements are also subverted by changing their contextuality vis-a-vis one another. Praveen —-> It is a very hard task to build what one can be proud of. A project is governed by many aspects, like clients wishes, budget cuts, changes in requirements etc. The act of designing and executing the project also changes the designer, so one also evolves during the course of the project, and so one may want to improve what he/ she designed two years back, and at the same time, you cant go back in time, and effect changes. It is only sometimes that I can feel proud of what we accomplish in our projects. These moments are rare, but that is what makes everything worth it. And what building are you most proud of? Praveen —-> I don’t think I am proud of any single building. I am satisfied with certain aspects of some of my buildings. We have done a decent job with my own farm house, as well as another farmhouse near Belgaum. 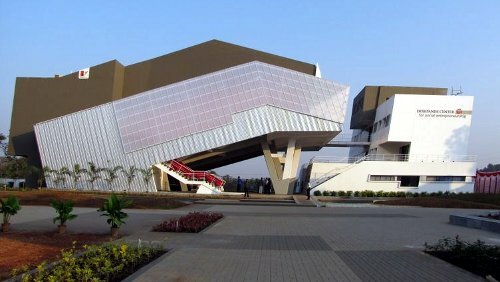 Also, the Deshpande Center has shaped up quite well. Gangubai Hangal gurukula is quite innovative with its forms and spaces, as well as the way we have used traditional forms and materials in a contemporary way. But dealing with government agencies was frustrating, and it shows in the end result at places. A corporate office near third gate is really coming out well, and should be ready in a month or two. I have got something I like in all my projects, and also something I don’t like so much in all my projects. Its the proportions that change from project to project. As the cliché goes, our next project is what we look forward too, and what we are most proud of. One should realise, that as architects, we are not in stasis, but we are being changed by the process of our work itself. So, every new project is informed by what we have done. Praveen —-> Ofcourse aesthetics and functions are integral to any piece of architecture, but architecture can go beyond simple readings of form and functions – It can anticipate new ways of inhabiting space and sometimes new forms can lead to new and innovative ways of inhabiting space. Function is of profound importance to us, but not in the reductionist sense that a building has to be functional. We analyse the intended functional aspect of the proposed building, in order to find openings to suggest new ways of inhabiting space. Recently, in many of our project, we are combining climatological strategies as a tool to generate interesting social spaces. In a corporate office project, the western facade takes the form of a double skin, one of glass another of perforated steel, spaced apart by about ten feet. Green Terraces at various levels between the two skins serve as informal meeting zones. This device, not only generates a nice facade, but also regulates the westerly winds into the building, cooling the space, diffusing the harsh afternoon sunlight, and creating an interesting social space for the occupants. In many of our projects, we try to make the functions explicit through the form, but I am always uncomfortable if I am only addressing form in buildings. Praveen —-> The architect/ urbanist designs the built space in which society operates. Society as we know unfolds in space, be it public squares, schools, prisons, hospitals or even single family residences. So, in a way, the architect often considers himself as super-powerful, with the power to effect change in society by merely altering or re-thinking built space. An architect, who studied under frank Lloyd Wright told me, that Wright played an seminal role in the emancipation of American women, by physically integrating the kitchen with the family and living areas. His open plan houses liberated women from their traditional roles. Architect Le Corbusier, propounded this theory in the 1920’s, that either politicians and policymakers have to effect drastic changes in the way cities are built, in order to address the inequalities in society, or should be prepared for revolutions – architecture or revolution, that was his war cry. So, maybe since modernism, architects do believe that they are vested with powers to effect large scale changes in society. The reality is quite otherwise, the role of the architect is often subverted by more powerful elements. Most of the ‘star-architects’ (starchitects) we have today in the west, are pandering to highly corrupt and autocratic regimes in order to get their projects built. But also, on the other hand, many countries and cities, China and Dubai are good examples, are using architecture to brand themselves. This unfortunately doesn’t happen in India. Great civilisations have always left behind great architecture, so if you look at most of our public architecture, you will know what legacy we are leaving behind for our children. Narrate some interesting incident good or bad during your career till date? Praveen —-> I cant think of any specific moments. My career, if we can call it that, is too chequered. My career, is as much about designing space, as it is about designing and organising my own studio. I am trying to create an architectural studio, that is constantly innovative, and gives scope for creativity and excellence for the people who work here. I have been partially successful in doing this, If you visit thirdspace at any time, you will see that my colleagues revel in the process of design. There is exuberance in the way we operate. So, the best moments are when we, as a team, are working on competitions, sometimes, as deadlines approach, we don’t sleep for days together. And for all this intelligence, he/ she should be dumb enough to choose a profession that is one of the worst paying, requires long working hours, and where the success rate is quite miniscule. An architect will always be lesser paid and more over worked than his friends and peers who have studied as much, and are in different professions. But at the end of it, if you can be proud of atleast one project that this world inherits and inhabits long after you are gone, then it is all worth it. If you are really good, then you leave behind a oeuvre of works and a thinking that inspires generations of architects, and changes the face of the earth forever. Praveen —-> Its very hard to say. One thing is for sure, only inspiration is not enough. Every iota of inspiration requires 10 times that amount of perspiration to create a good piece of architecture. In architectural parlance, the catch word is ‘rigour’. Praveen —-> My dream city would be a city that combines layers of history integrated seamlessly with the best of technology and architecture that is on offer today. It should be highly urban in its makeup, but with large dollops of nature. In fact, nature, agriculture, industry, culture can all integrate into a whole. I was in Istanbul recently, and that city blew my mind. The people who live there exude a rare sense of happiness and warmth, and at the end that is what it’s all about – a dream city is one that generates contentment and happiness. Praveen —-> Ofcourse, there are historical connections. Architecture, may be, as said by one of my teachers, the ‘founding’ metaphor of philosophy, but it also constantly references from the other fields, be it art, literature, cinema, or even plant science and genetics. We love to appropriate other disciplines. Also, currently architecture is looking at diverse fields, from organisational theories to computational game theories, you name it. Praveen —-> Belgaum has some of the traits that I mentioned about my idea of a good city, but in a very latent way. Though, I like to stay in Belgaum, and I like to see my son inhabit and negotiate the very same spaces of my childhood. Its still uniquely cosmopolitan for a small city. Other similar sized cities tend to be mono-cultural, and multi-culturalism is its greatest assets. It has had a history of theatre and the arts, and that is what makes a good city. I have always loved it best, when I was staying away from here, when, there was a certain amount of touristic engagement with the city, rather than when I am its citizen. But, the best thing for me here, are its people. People are very well informed here, and I am very happy with the people for whom I do my work- my clients. Most of them, not only allow me artistic freedom, but they also enthusiastically collaborate with me to do some pretty experimental work. Praveen —-> It ‘IS’ all about belgaum, in every which way. I would have loved to have this site around when I used to stay outside…it would have given me my daily fix of nostalgia, that I used to crave for. Even now, I check it a couple of times a day, to see what’s happening in the neighbourhood. It is my equivalent of looking outside the window. This is a site that effectively demonstrates how technology today has transformed the dessimation of information, and how it can become an effective tool for communication in the hands of the right people. I UMESH GODSE had worked at Late Smt Gangubai Hangal Gurukul campus at Hubballi on plumbing. I very well know Sir the contribution was par excellence.But as you said Sir the Govt agencies don’t have the heart to praise such contributions, it’s very true Sir and as of me I am very proud of myself to have worked under your guidance Sir. Our Sir Ashok Kavaloor would never worry about my plumbing work and just use to give me weekly print outs sent by you Sir and use to say just carry on with this and don’t ask anything. I have learnt some important issues in plumbing from you Sir. Once I want to visit your premises and meet you Sir. But i was not happy with the response these agencies gave at the last moment. Certain decisions I had take regarding plumbing at the last stage, and I succeeded also with the help of your guidance. I still feel very sad that I hve not met or seen even a single Architect or an Civil Engineer except You Sir who designs any construction keeping the water aspect in mind. Still today i argue with engineers and Architects regarding water issue but they don’t listen to me. Anyway Sir I will come and meet offcourse with your due permission. Sir can u provide email id so that i can mail my portfolio for internship…. I would like to meet you regarding construction of house. Where shall I meet? Give me your address please. Praveen is always a fresh and innovative thinker. His creations are well placed in theory and real world both. Best wishes to the Master Architect. sir i appreciate your work..
can i get to see the details of the Gangubai Hangal Gurukul?? Hi sir i want to work with you ,i am a civil engineer, pls let me know your address. i am looking for designing my new farm house. Let me know you address and contact no. Good luck for all your future endeavors..
How Praveen is related to Dr Bavadekar, who was Ortho surgeon in Bombay and in turn related to Gangadharrao Deshpande? Can some one tell me? I am also from Begaum and keep visiting the city every year. But it is not the same each time! I go back more frustrated. I am Dr. Arvind Bavadekar's nephew, his elder brothers son. He ofcourse was truly remarkable, and his life is a constant source of inspiration to me. Thanks Praveen, I would like to meet you next time I visit Belgaum. I live and work in Saudi Arabia. I have met Dr Bavadekar few times in Bomaby. A remarkable professional and an individual. Very nice and interesting note !!!! A grand salute to Mr. Praveen Bavadekar. P.B comes across as someone who isn't just passionate about his work but as someone who knows what creativity is all about… the first time I visited Ajanta Cafe I was reminded of the book Fountainhead …for the unique and innovative design ..the courage to create something diff from the typical square structure. Long way to go Praveen!!! Good Luck!! Nice interview. Having known Praveen personally, I must congratulate the interviewer to have brought out facets of him and his personality and thoughts which stand a chance of going un-noticed in small chats/interviews. That said, I do agree with him that for people like me, who are staying away from Belgaum, this site offers the daily fix of nostalgia. Good Luck to Praveen and AAB!! !